Back in the 1870s two giant charcoal kilns were built in order to turn wood into charcoal for the silver mine up at Cerro Gordo. Although most people when they think of mining and precious metals in California think of gold, silver was also a popular metal mined in the state. 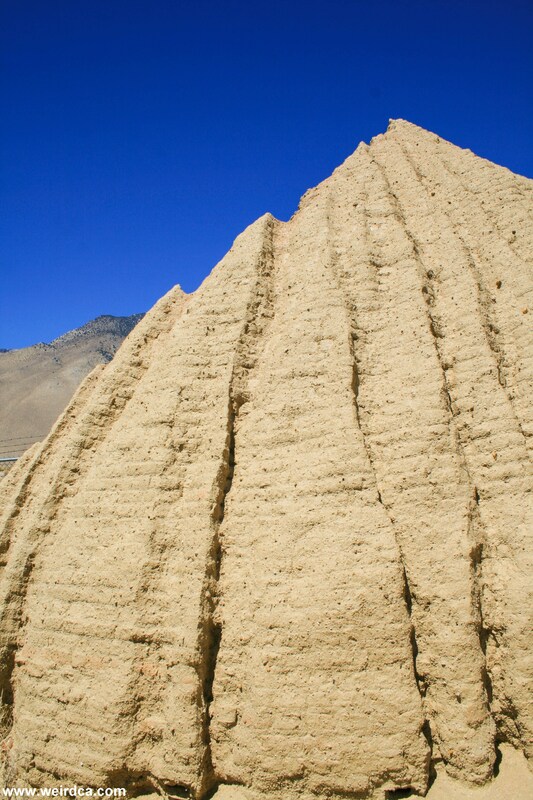 One silver mine was Cerro Gordo located near Lone Pine and the now dry Owens Lake. Silver and also lead was discovered at Cerro Gordo in 1865 and from 1868 to 1875 about $13 million in silver / lead bullion was shipped out which made the Cerro Gordo mines the most prosperous mine for those metals in California history. So prosperous was the mine that infrastructure for it rapidly sprung up through out the area. The silver ingots were dragged down from Cerro Gordo to Cerro Gordo Landing now called Keeler. Mule teams taking the silver direct from Cerro Gordo Landing to Los Angeles took too long, causing the silver ingots coming out of the smelters to stack up. One report states that Cerro Gordo literally had so many silver ingots backing up for transport that they started constructing buildings out of them. So instead steamboats were put on Owens Lake and hauled the silver ingots across it to Cartago in order to shorten the route to Los Angeles in order to deliver the silver faster. It normally took three days to go around the lake. Cutting across it by steamboat took three hours. The steamboats, Bessie Brady and the Mollie Stevens, also transported lumber and charcoal from across Owens Lake at Cottonwood Canyon. In order to smelt the silver ore and eliminate the impurities, the smelter requires a tremendous amount of heat. If you used wood or coal in the smelter they burned too fast and didn't make enough heat. And so kilns were built near a lot of mining operations in order to turn wood into charcoal and coal into coke, both slow burning and producing high amounts of heat. 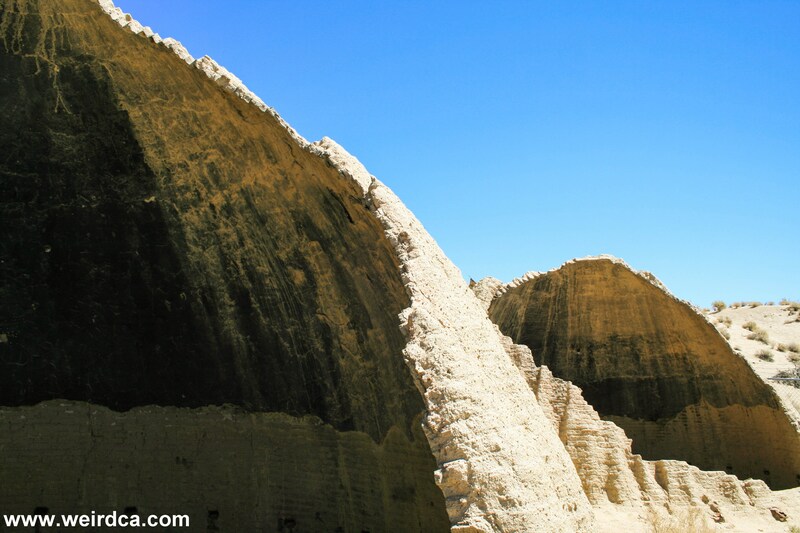 Two large charcoal kilns were built in Cottonwood and they still stand to this day. Whereas most kilns are built using bricks or stone, these two were built out of clay bricks which were covered in plaster and look very much beehive like. Wood would be loaded into the kiln by way of the ground level door, until stacking it by that method became too difficult, then more wood would be lowered in by the upper door. When the kiln was full, the doors would be closed and the wood inside set ablaze. Vents at the bottom of each kiln were opened or closed as necessary in order control the burn. For about ten days, the wood would cook slowly into charcoal. Afterwards, the charcoal, along with lumber from the nearby saw mill were loaded up on steamboat, sent across Owens Lake to Keeler and then hauled up to the Cerro Gordo mine. 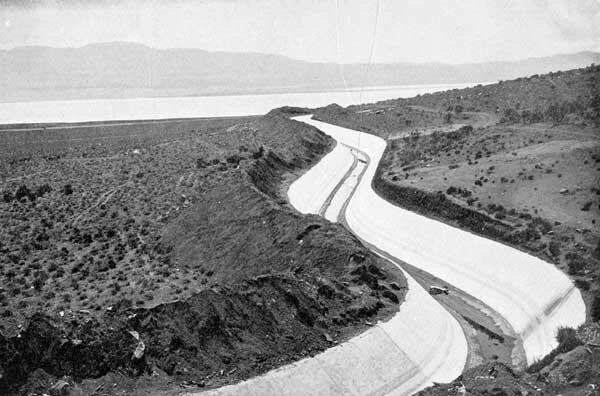 In 1913, with construction overseen by William Mulholland, the first part of the Los Angeles Aqueduct finished construction and began to feed water from Owens Valley into Los Angeles. By the 1920s agriculture in the valley literally dried up as much of the water had been diverted away. This led to the California Water Wars when local farmers in 1924 began fighting back against the aqueduct even going so far as dynamiting parts of the aqueduct system. But by 1927, due to corruption and embezzlement at the local Inyo County Bank, the resistance to the aqueduct ceased when the economy of the area fell after many of the local farmers and businesses lost all their money from the collapse of the bank. Owens Lake is completely dry now. But during the silver mine's hey day, Owens Lake was filled with water and two steamships, the Bessie Brady and the Mollie Stevens, sailed across her waters. The Bessie Brady started in 1872, while the Mollie Stevens started in 1877 mostly transporting between Keeler (originally called Cerro Gordo Landing depending on the year), the Cottonwood Charcoal Kilns, and the town of Cartago. Due to declining mining operations, they were taken out of service in 1878 and 1879 and left on the banks of Owens Lake. Mining, however, soon resumed and in 1880 the Molly Stevens was called back into service, but the small steamship couldn't quite handle all the work, so in 1882, Bessie Brady was dragged off the beach, outfitted with Mollie Stevens engine and sent back out onto the lake. But on May 11, 1882, Bessie Brady caught on fire and was quickly destroyed by the blaze. With the arrival of railroad tracks at Keeler, new steamships were not necessary. Of course, though, the legend doesn't stop there. Stories talk of $200,000 in bullion that was supposedly lost aboard either the Bessie Brady or the Mollie Stevens. When the story tells that it was lost aboard the Bessie Brady, the story usually states that it happened when the ship went ablaze and sank. The other story details two wagons loaded up with bullion. One was apparently not chained down correctly, and a very strong wind caused the wagon to topple off the steamer and into the 23 to 50 foot deep lake. As to the veracity of $200,000 in bullion lying in the now dry lake bed of Owens Lake, one can neither confirm nor deny. But over the years other items have been found in the salt flats of the lake, including a 400 pound iron anchor and a 300 pound ship propeller! And of course a ghost story has sprung up around Owens Lake. It is said that a ghost steamship, that of Bessie Brady, still sails the now dry lake. Witness have reported seeing the spectral steamer sailing the non existent lake, smoke billowing from its smoke stack and a flag waving in the wind. If you see the ship's ghost some moonlit night, perhaps you should follow it; maybe it will lead you to the missing bullion. Sadly since the kilns were made out of clay bricks, they have certainly taken a toll from the elements. 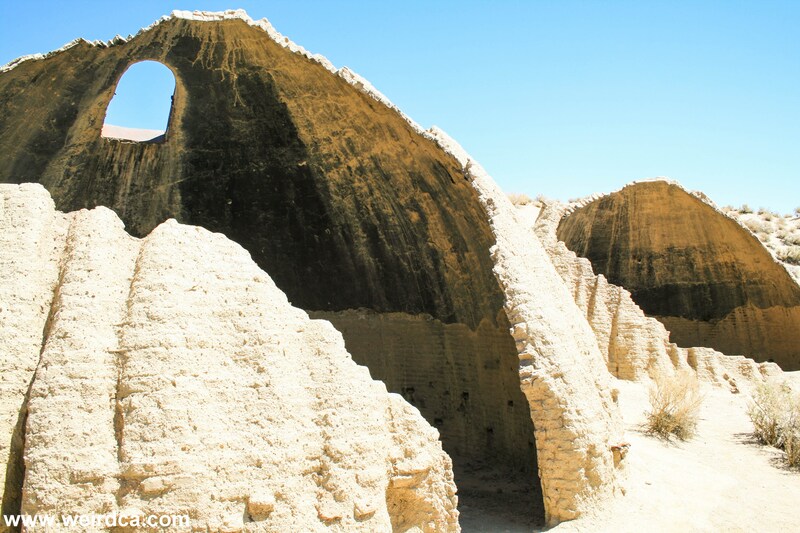 Rain, wind, and sun have damaged the kilns, yet they still stand, granted with extremely crumbled southern sides. The silver at Cerro Gordo played out fairly quickly, but zinc was discovered in the mines a few decades later, causing the town to become important again. This also didn't last, the zinc mines running out in 1938, and now Cerro Gordo is a ghost town. The town of Keeler had the train tracks removed in 1961. Cerro Gordo reportedly still has the ghosts of those old miners and other visitors from back in the 1860s and 1870s. Both the American Hotel, built in 1871 in Cerro Gordo and the general store are rumored to be haunted. 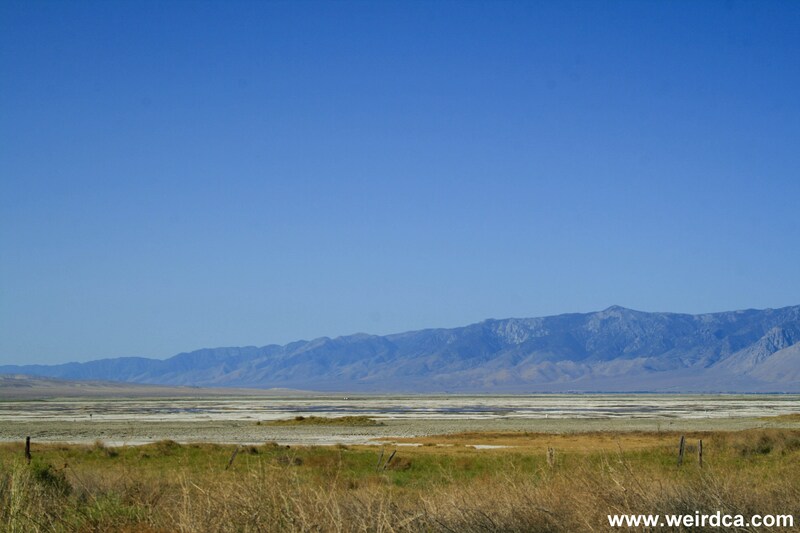 Also long ago, back when the trains ran to Lone Pine and the rest of the area, four passengers on one of the trains, all in different parts of the train witnessed a full on ghostly battle taking place near Owens Lake. Native Americans were battling American soldiers, the sounds of the horses and gun shots rang in the passengers ears, and the men and animals looked real. Both soldiers and Indians fell in the battle before the witnesses. Upon arriving in Lone Pine, the witnesses told their tale . . . their tale of a battle that had actually taken place near Owens Lake over six decades before. Other ghostly Native Americans have appeared near Lone Pine, back from the days when settlers tried taking their land, and the Indians resisted, which brought in American soldiers to put down the "resistance" leading to multiple battles and skirmishes between the Native Americans of the area and the U.S. soldiers. 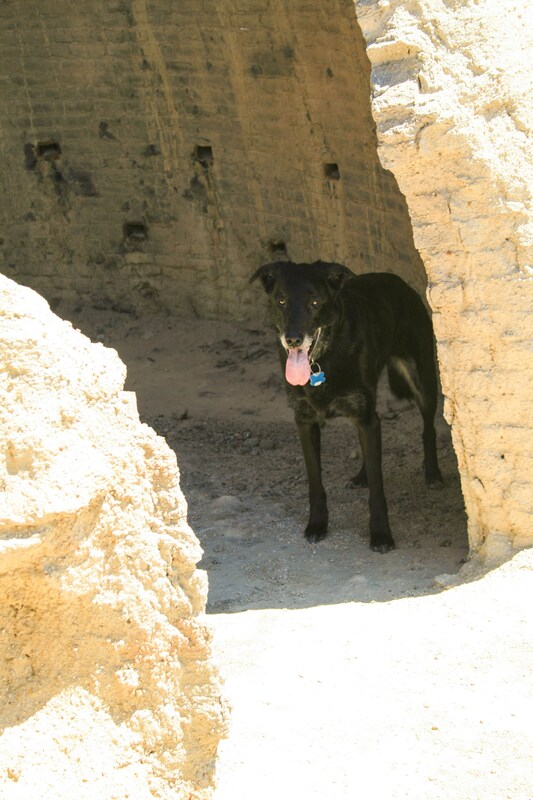 The kilns are California Historical Landmark #537 and can be found along Highway 395 about 13 miles south of Lone Pine. There is a dirt road that heads east off of the highway and runs about one mile before you arrive at the kilns. The dirt road continues down to the dried up Owens Lake. In June 1873 Colonel Sherman Stevens built a sawmill and a flume on Cottonwood Creek high in the Sierras directly west of this spot. The flume connected with the Los Angeles bullion road. The lumber from the flume was used for timbering in the mine and buildings, and the wood was turned into charcoal in these kilns, then hauled to Steven's Wharf east of here on Owens Lake. There it was put on the steamer the "Bessie Brady" or the "Mollie Stevens," hauled directly across the lake, and from there wagons took it up the "Yellow Grade" to Cerro Gordo Mine, high in the Inyo Mountains above Keeler. M. W. Belshaw's furnaces had used all available wood around the Cerro Gordo and this charcoal was necessary to continue production. The bullion which was taken out by the reverse of this route was hauled to Los Angeles on Remi Nadeau's 14, 16, 18 animal freight wagons and played a major part in the building of that little pueblo into the city of today.